Snakes! Where are their arms and legs? It’s not ok! 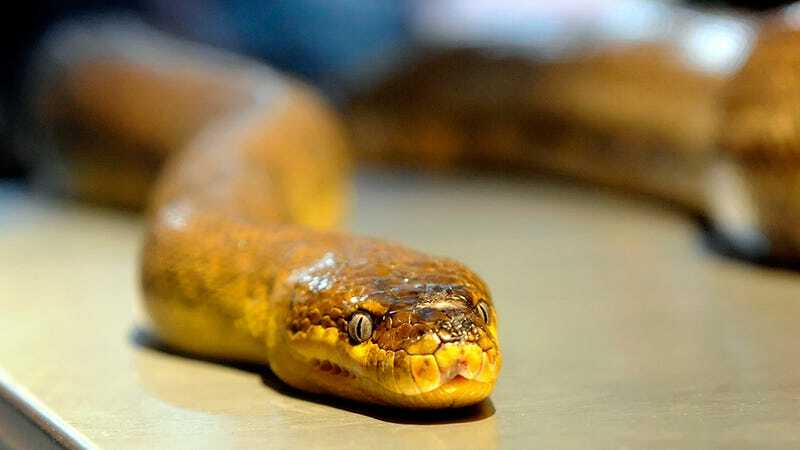 Over 100 million years ago, snakes did have four appendages, and then evolution stepped in to turn the reptiles into the creepy, slithering freak show that they are today. Now, researchers believe they’ve isolated what caused this change. Two separate groups of scientists have come to similar conclusions about a mutation in what’s known as “the Sonic hedgehog gene.” Previously, scientists found that the gene played a role in determining leg size in lizards. This led them to believe that it is also important to snakes’ biology. One of those scientists is Martin Cohn, an evolutionary developmental biologist at the University of Florida in Gainesville, who has just published a report in Current Biology. Working with graduate student Francisca Leal, Cohn has made a major development in a study he’s been working on since 1999. According to Science Magazine, Cohn “discovered that snake embryos had a different pattern of activity of certain genes than other reptiles and that applying a growth factor could make those embryos start to grow limbs.” But he needed more advanced genetic tools to investigate further. They found three DNA deletions in the genetic switch that controls the activity of the Sonic hedgehog gene. Situated in front of the gene, this switch, called an enhancer, is a docking site for proteins that control the gene’s activity. The deletions made it difficult for certain proteins to land, resulting in only a brief window of gene activity during the development of the python embryo. When the researchers looked at snakes that do not have leg bones, they found even more deletions in the enhancers. On the same day as Cohn’s report, Axel Visel, a genomicist at the Lawrence Berkeley National Laboratory in Berkeley, California, published his own findings in Cell. Visel was able to use the CRISPR-Cas9 gene-editing technique to test out the theory. Using mice as a subject, he and his colleagues subbed in the snake version of the Sonic hedgehog enhancer, as well as fish and human versions. For the mice that were given the fish and human enhancers, the legs grew normally. The mice with snake enhancers developed little nubs. It’s possible that the Sonic hedgehog enhancer wasn’t the first cause of leg loss “but it’s certainly a major player,” says James Hanken, an evolutionary developmental biologist at Harvard University. So far fellow scientists have praised both of the researchers’ findings, and the two say there’s plenty of research still to be done.